Google AdSense is a great way to monetize your website. Even relatively new blogs can earn an income using Google AdSense. The way website owners can make money from Google AdSense is by displaying advertisements on their websites. When visitors click on these advertisements, the website owner is paid a small portion of the cost per click. If you haven’t already, make sure you have created an Adsense account and got approved before going ahead with this guide. 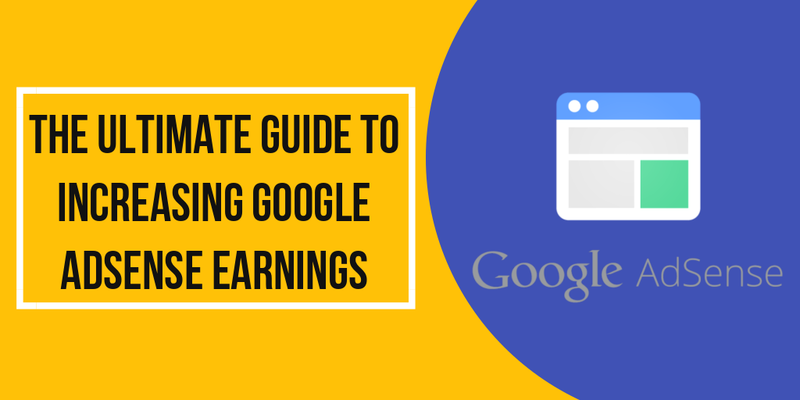 In this post, we are going to look at ways to really boost your Google AdSense earnings. 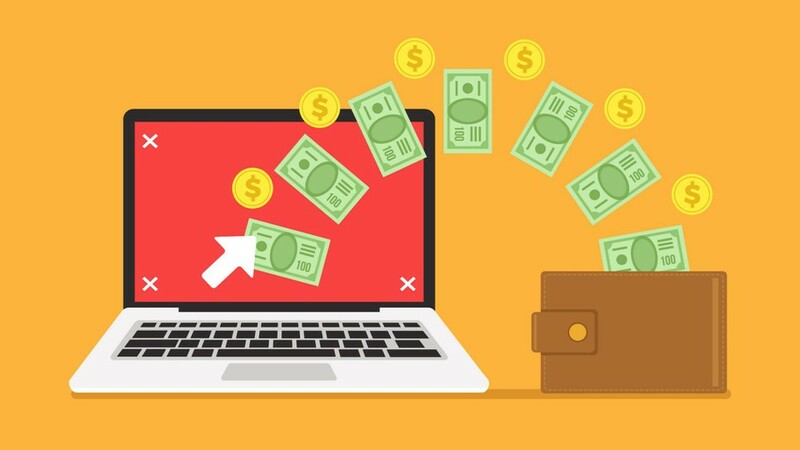 While most websites have the potential to monetize their sites with Google AdSense, there are a few tricks to ensure you’re making the most of it and reaping the financial rewards. Taking the time to learn about Google AdSense and what can work best for your site will make a massive difference to your next Adsense payout! You need to ensure that Google AdSense is linked up with your Google Analytics. Google Analytics is a software that is linked to your website using a tracking code. This little piece of code is then added to the back end of your site. This marketing tool can be used to measure visitors to your website and their behaviors. This data can be used to assess the success of a campaign or advertisement in real time and compare the results. Once your Google Analytics is connected correctly, open it up and click on the “Behavior” bar, which should be on the left-hand side. This is the little gold mine where all the data about your website visitors will be collected and stored. And it’s this data that will help you to work through the information below. It can seem a little overwhelming and there is a lot of information. But this is your income we’re talking about! Break this information down into manageable pieces. Work on one topic at a time and familiarize yourself with the process and do the research for your niche. Remember, this information is important and has the potential to double or triple your AdSense earnings if you commit to testing different advertisements, running campaigns and comparing your data in Google Analytics. Use these steps to arm yourself with the knowledge you need and invest the time into your site and you will see rewards. OK. Ready to grow your Google AdSense income? To really reap the benefits of Google Adsense we are going to look at the following topics in more detail. There are a number of different types of advertisements that you can use. Advertisements can also vary in size and some display text, while others use images or videos. AdSense for Content: This would be described as the “main” AdSense and is recommended for all website owners. Adsense for Search: This allows you to add a Search bar to your website that will make you money rather than the generic search bar that came with your website theme, or one you’ve added with a plugin. It’s worth noting that there are other more obscure types of AdSense advertisements. I seriously recommend you get your Content and Search Advertisements working effectively and then look at expanding into other areas! So make sure to add Adsense search to your site to increase your Adsense revenue. There are a number of different sizes of advertisements. Google recommends the following sizes to maximize AdSense earnings. Does this mean that you shouldn’t use any other sizes? This is where your Google Analytics will come in. Use the data to see which size advertisement is getting the most attention. You may even like to set up a trial where you run a certain size for a week, then a different size for the next week and compare the results to see what works best for your site. Text advertisements are as the name suggests. Text ads can work great particularly if your website has a lot of images already. Text advertisements are the format that Google recommends and the majority of websites will see results from text ads. If your website is mostly text, image advertisements can be a good option. Website owners can sometimes worry that display ads such as images and video can affect load times. Google advises that Image advertisements are approx. 150KB in size and should have minimal effect on load times. Again, look to your Google Analytics to see what works best for your website. You can opt that only Text Advertisements are displayed on your site and you can also opt that both are displayed on your site. Track the movement on your Google Analytics and make the call on what is best for your site. The “right” type of advertisement for your blog will also largely depend on how it actually looks. There was a time when Google recommended that the advertisement was visually loud, bright and super eye-catching. This is not the case anymore. Remember that your website is your baby, and we should all be putting our children first! Create advertisements that are cohesive with your website design and branding. In an image-driven society, we are naturally drawn to things that have a pleasing aesthetic. Think about a time when you’ve gone to a website and your eyes have literally been assaulted with intrusive, over the top colors and bold graphics. The website immediately feels spammy. If a website is overrun by advertisements and feels spammy, guess what? The visitor feels mistrust. Your website essentially becomes tacky and untrustworthy in the mind of the visitor and they will leave. On the other hand, your visitor has landed on your blog because of your catchy title and because you have something to offer that is of interest. Which website would you spend the most time on? Which website would look more professional and trustworthy? You use the Internet all the time, right? So THINK like a visitor. How will your visitors navigate your site? Where will they naturally look? This leads us to our next topic, where to place your Google AdSense advertisements. There is no one rule about where you should place the advertisements on your site. The best location will depend largely on the habits and behavior of the visitor, and this will vary from website to website. Generally speaking, there are some areas that perform better than others. Typically the area just prior to the main content and also the left sidebar performs well. Your priority for your website should be the visitors’ experience. Consider how the visitor will use your website, where their eye may naturally move to and the overall flow of the site. Advertisement placement should never impede on the usability of your website. You do not want to sacrifice a loyal visitor because your advertisements are intrusive and spammy. So let’s have look at the most popular locations for advertisements. Advertisements placed within the main content is becoming increasingly popular. Think about your blog post and where the article ends before the reader needs to scroll down to continue. That’s the position I’m talking about. This is often referred to as ‘before the fold’. So think about how that would look and feel to your visitor. In my opinion, it just looks like an unobtrusive footer. I need to take a quick break in order to scroll down and continue reading so why not have an advertisement to scan over? A horizontal text banner advertisement should do well here. It’s not obtrusive as it’s not too tall, and being placed at the bottom of the first screen is like a natural “break” in your paragraphs. This one is placed between your navigation bar or menu and the title or the beginning of your content. This is a really traditional advertisement style that we have all become used to seeing over years of Internet usage. Similar to advertisements within your content, you’re going to keep this banner ad thin and wide. The reason for this? Google can actually penalize you if a huge advertisement in this location pushes your content below the fold. This will also be viewed as overkill and intrusive by your visitor. Not that should be relying on this, but this is a great position for the accidental click. We’ve all done that! Intending to click on the navigation bar and accidentally clicked the banner advertisement! The bottom line is that the user will naturally be drawn to the navigation bar and the advertisement will attract their attention. A lot of website designs are automatically geared to shrink down when viewed on smaller mobile devices. This will leave white space down the left-hand side of your post. Most bloggers will use this area for ‘sticky’ social media sharing buttons, but it can also be used for vertical advertisements. As English is read from left to right, it stands to reason that the left sidebar is a prime real estate for displaying Google AdSense advertisements. You will have seen the group of thumbnails at the bottom of many websites, encouraging you to click on ‘related’ links. Here’s the scoop. More often than not they are actually sponsored links. Displaying advertisements here can be profitable particularly when the ads displayed look a part of the website rather than a separate advertisement. I cannot stress enough the importance of running comparative tests with both the style of your advertisements and their placement. Running tests and referring to the data collected by Google Analytics will be a valuable tool in determining the best location to place your advertisements. It may seem like a lot of work but I can assure you that it will make all the difference to your long-term financial gain. Using the right keywords on your posts is extremely important and can indirectly affect your Google AdSense earnings. As website owners and bloggers, we are always looking to increase our organic reach and our traffic flow. Furthermore, posts with popular keywords will have a better return and yield you more money per click. If you focus on SEO and your keywords are searched regularly, chances are you’ll see an increase in your Google AdSense earnings. Keep in mind that when someone searches a particular keyword in Google which directs them to your blog, it stands to reason that the visitor will be more likely to click on an advertisement because it is relevant to what they were searching for in the first place. Internet user searches for “karate for beginners” and lands on your Karate Blog. Google AdSense will show banners and adverts relating to that Karate niche such as Karate equipment sales, local Karate school or online Karate courses. More than likely, the user will already be interested in Karate because they’re searching for information online and therefore more likely to click on the advertisements. So I guess the best thing you can take from this is that content is king! Providing great content that solves a problem or answers a question for your visitor is what’s going to bring them to your site. The more targeted information and more relevant keywords you use will increase the likelihood that they will end up on your site and click your advertisements. It is completely worth your time to research the best Keywords for your website. If your aim is to just entertain your existing readers or to perhaps covert your visitors to regular readers, you may think that Google AdSense and Traffic are unrelated. If your goal is to secure a regular income from Google AdSense you are going to have to make increasing your traffic your priority. Will the size, color, and type of advertisements really matter if no visits your website to see it? Your committed readers that have already shown loyalty to your blog or website are great, but these visitors see your page regularly and are unlikely to click on your advertisements repeatedly just to help you increase your paycheck. What bloggers and website owners need to focus on is increasing their search engine traffic. The search engine traffic is the people that are searching popular terms looking for information, advice or a particular product. This is the traffic that you want to help increase your earnings. Think about it. Like in the example above, someone is searching for posts on “karate for beginners” – this person is already looking for information on Karate. So while they are reading your blog post titled: “KARATE FOR BEGINNERS” your Google AdSense banner is displaying an advertisement for an eBook about Karate and Fitness. Who is more likely to click on that advertisement? So while I know first hand how hard it is to attract and keep a loyal following, to increase your earnings give some thought to your search engine traffic and the one-off readers. If you’re creating quality, helpful content your traffic will increase. You will be enticing the right type of visitors who will be more prone to click that advertisement. AdSense works based on the content of your page and will send search engine traffic to your blog or website based on its quality. Google AdSense will provide performance reports to help you collate data on your earnings. To really use these reports to their full potential, you will need to import your URL channels. These performance reports will, of course, show you how much you’re earning through the AdSense program. But where the real value of the performance reports lies is with the insights it can provide on how and what is driving those earnings. Being able to drill down the categories and the statistics to gain insight into what impacts your earnings can only be beneficial to your bank balance. GRAPHS: You can switch between pie charts and column graphs depending on what you find easiest to understand. DATA BREAKDOWNS: You can filter and sort and really delve into your performance data. Isolate the types of advertisements, countries, platforms, and dates. And how handy is this? Once you have set up a report, you can set it to run methodically on a daily, monthly or weekly basis and have it emailed to you automatically. This performance report data combined with what’s being gathered by Google Analytics will give you a complete overview on what’s impacting your earnings. And with the knowledge, you’ll be able to tip the scales in your favor. 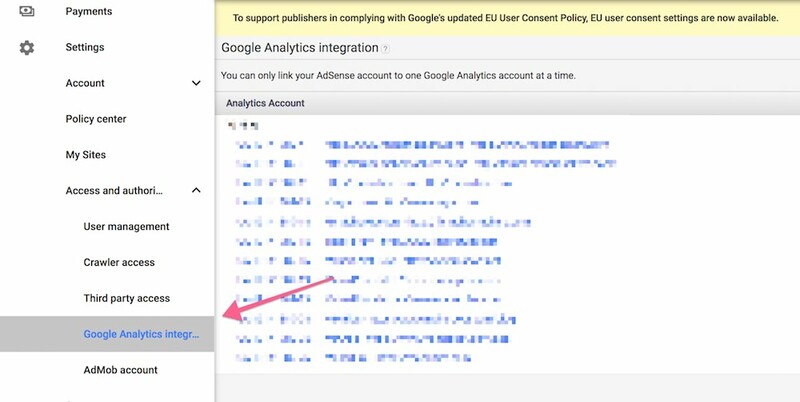 Now, open “Google Analytics Integration” page; Click on Link next to the Analytics account that you want to link with your AdSense account. A dialog box appears; put in the details of your Analytics profile and continue. It is not enough anymore to write your blog post and share it on Facebook, tweet it and post a link to it on Instagram. You’re essentially sending your hard work out into the world completely unsupervised and hoping that it does a good job. Did you know that less than 10% of blog posts are shared around 8 times? 8 shares will not increase your Google AdSense Earnings. For starters, you need to get involved in the online community. Join Facebook groups related to your niche that allows the sharing of information and related links. Related links such as YOUR website or blog. Just type your niche into the search bar on Facebook and watch the opportunities unfold. The huge bonus is that the people that belong to these groups are already interested in your topic; they just need some help in finding you. You can easily automate this step by using a Facebook auto group poster tool like MaherPost. Remember to build your standing in this online group before trying the hard sell. Again: Content is KING. If you’re not providing something of value to others, don’t share it. Be genuine and helpful and people will want to check out what’s happening on your website. Similar to Facebook, Pinterest is now one of the largest traffic-driving social media channels. You are letting Google AdSense earnings slip through your fingers if you are not utilizing Pinterest. More than a social media platform, Pinterest has become a search engine tool for many people looking for everything from recipes, tutorials, blogging information to gardening tips. And the best part? You do not need a large Pinterest following or even any Pinterest following to have Pinterest drive traffic to your site. Again, you just need great content and an eye-catching Pinterest graphic. There are group boards on Pinterest where you can network with other like-minded souls and have your content repined and shared. Plugins that help monitor, install and customize your advertisements are going to make your life that much easier! These are the most trusted and used plugins for WordPress that can help you increase your Google AdSense earnings. Taking these steps to increase your Google AdSense earnings will require you to invest your time. BUT. This is your hard earned cash we are talking about, and taking the time to get this right will definitely increase your passive cash flow. All that we’ve covered here today, break these points down into manageable bite-sized pieces. One step at a time! Remember that your content is what will ultimately drive traffic to your website. Ensure that your content is offering valuable information or a solution to your visitors. Make certain that your content has well-researched keywords and is optimized for search engines. Once your content is amazing, market it correctly. Streamline the way you share your content and get involved in online communities that support your niche. And lastly, experiment and test test test! Your AdSense earnings will skyrocket if you take the time to find out what is best for your site. Using the data from Adsense performance reports and Google Analytics can change the way your passive income from Adsense is generated and will prove to be a sound investment in your website. 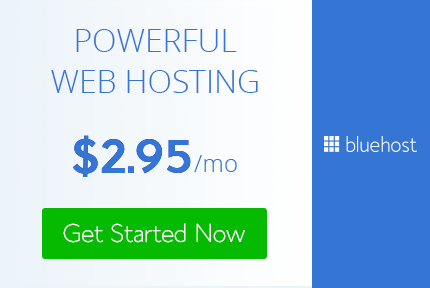 Previous Post: Best WordPress Hosting 2019: Top 10 Best Hosts, Compared!